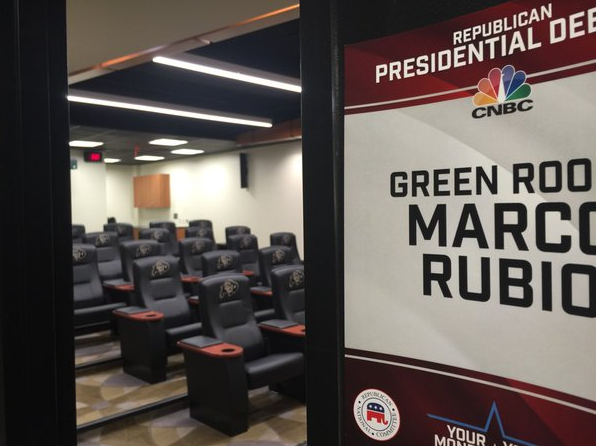 Donald Trump was probably pleased with his green room going into the third GOP debate. Chris Christie? Maybe not. Tuesday evening, some of the campaigns were complaining about their green room assignments during a walk-through, Politico reported, saying that top-tier candidates like Trump were assigned plush, comfortable quarters, while lower-tier candidates didn't fare as well. Ken McKay, Christie's campaign manager was quoted by Politico saying, "This is ridiculous....We're in a restroom." Chris LaCivita, a senior adviser for Rand Paul, tweeted photos of the green rooms assigned by the Republican National Committee (RNC) Tuesday night. The green room is where the candidates will spend some time before they go on stage - they'll get makeup, go over talking points, and get themselves mentally ready for their two hours of candidate combat. With so many candidates on the Republican side, it's no doubt difficult to find roughly equal green room accommodations. There has already been some controversy over the debate - Carson and Trump had threatened to back out if their conditions over opening and closing statements and the duration of the debate were not met. The Republican field meets for its debate Wednesday night, Oct. 28, in Boulder, Colorado - 6pm ET for the lower-tier candidates and 8pm for the top-tier candidates.